Imagine opening up a bill you just received and not being clear about what the charges are, when it’s due, or how much you need to pay. Sounds frustrating, right? Unfocus your eyes and try to find how much is due. Not easy! 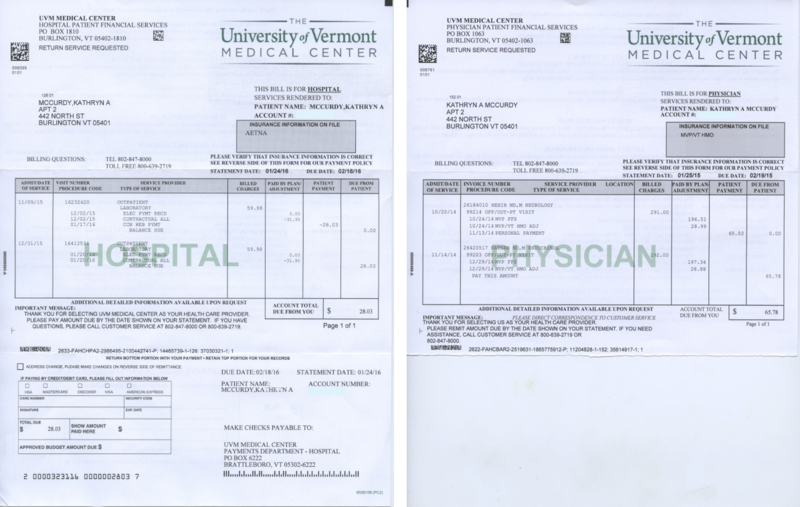 At the UVM Medical Center, we recently realized our medical bills were problematic for all of these reasons. They were confusing to read, and it wasn’t clear what to do if you needed help. 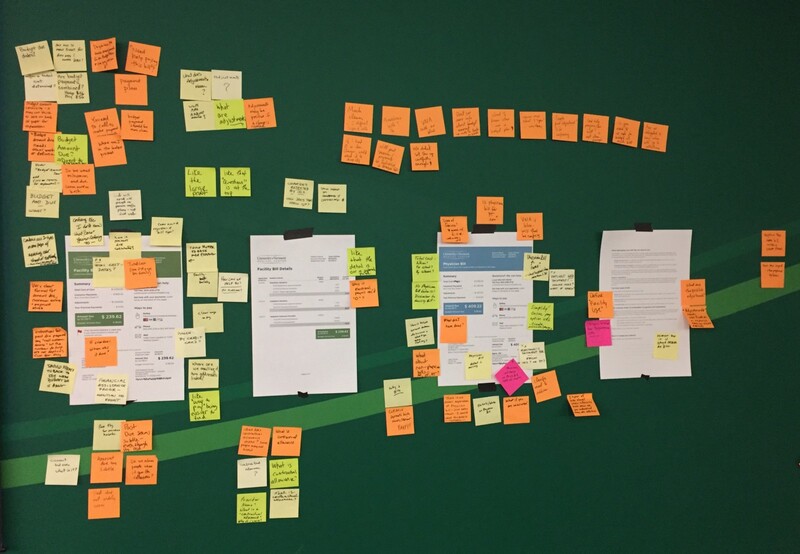 So we set out on a journey to redesign our bills using a human-centered design process. To kick off our project, our team of designers and writers did some usability testing with the existing bill. We wanted to confirm our hunches about what was wrong with our bill and build a greater understanding of the billing experience from the patient perspective. So we took the existing bill into the hospital, found some patients and visitors who had time to spare, and asked a set of open-ended questions to determine how much they understood about how much was due, when it was due, and other basics. In addition to testing our existing bill, we spoke with the phone and in-person customer service representatives who help patients with billing questions. They had lots of feedback and insights about which aspects of the bill are most confusing and what patients’ most common questions are. They coached us to make it more clear that financial assistance and reduced payments are available, as this is something that patients often do not know. One of the biggest problems customer service folks described is that patients often receive two bills for the same visit or service: one from the “Hospital” (for anything related to using the facilities, like lab work or costs related to staying at the hospital) and one from the “Physician” (charges from the specific physician(s) who treated the patient.) This 2-bill system is common in hospital systems, but it causes endless confusion for patients. They don’t understand why they’re getting another bill, when they just paid one. 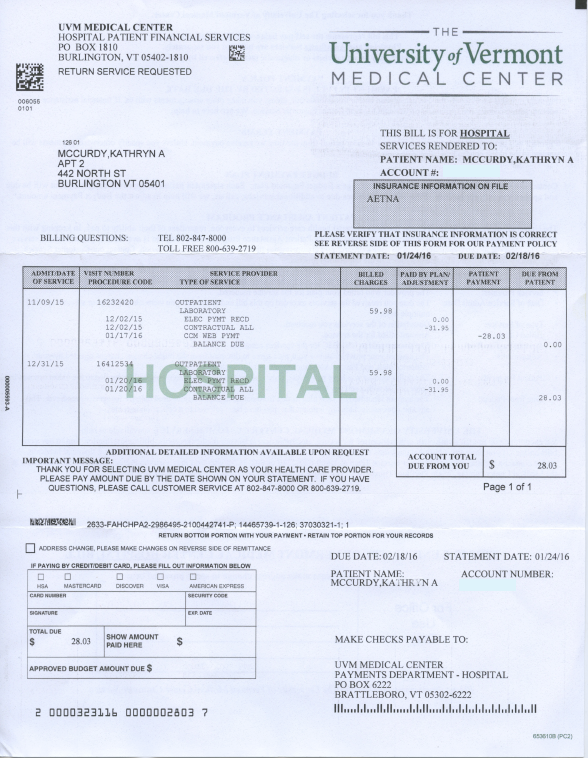 This confusion can cause patients to ignore bills and sometimes even be sent to collections. 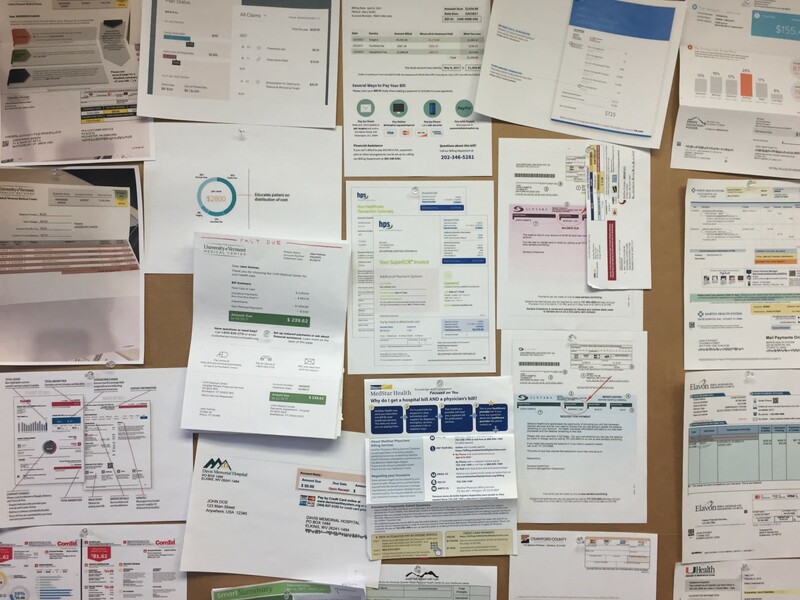 After learning from testing the current bill and talking with the customer service folks, we gathered inspirational examples of bills we liked from both inside and outside of healthcare and posted them up on the walls of our studio. We also took a detailed look at the submissions to the ‘A bill you can understand’ design challenge that Mad*Pow put on last year. Our inspiration board — anything but boring. Out of this initial research, we distilled a set of key insights and problems to solve, and a strategy and principles to follow in the redesign process. People assumed first page of the bill was a summary of charges, when it was actually the start of the detailed charges. Their eyes went straight to the detailed charge listing. This work set us up well for the next phase. Armed with our insights and design principles, we went back to our studio and started sketching up quick prototypes. 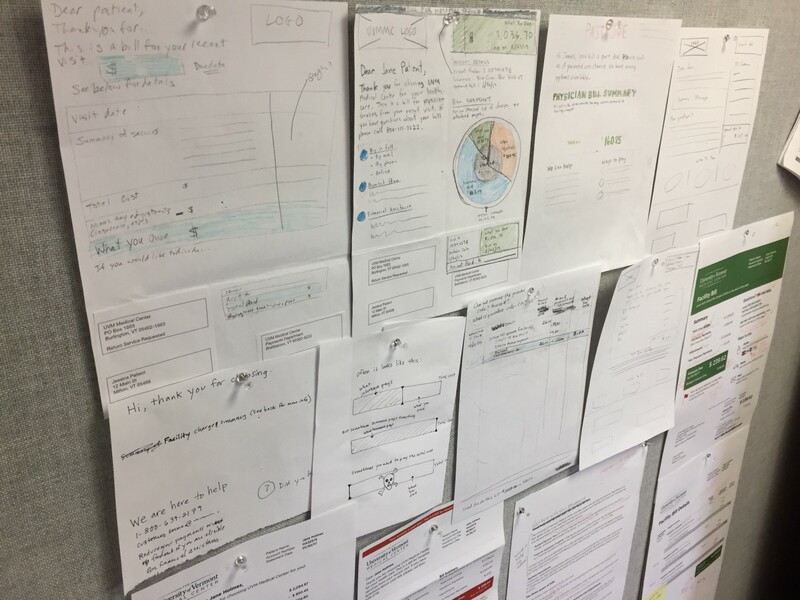 We kicked off by running a two-day ‘design sprint,’ which is design jargon for a short, focused period of time in which we create a prototype, test it with real people, and learn from it. We spent a day brainstorming, sketching out concepts based on our prior research and insights. 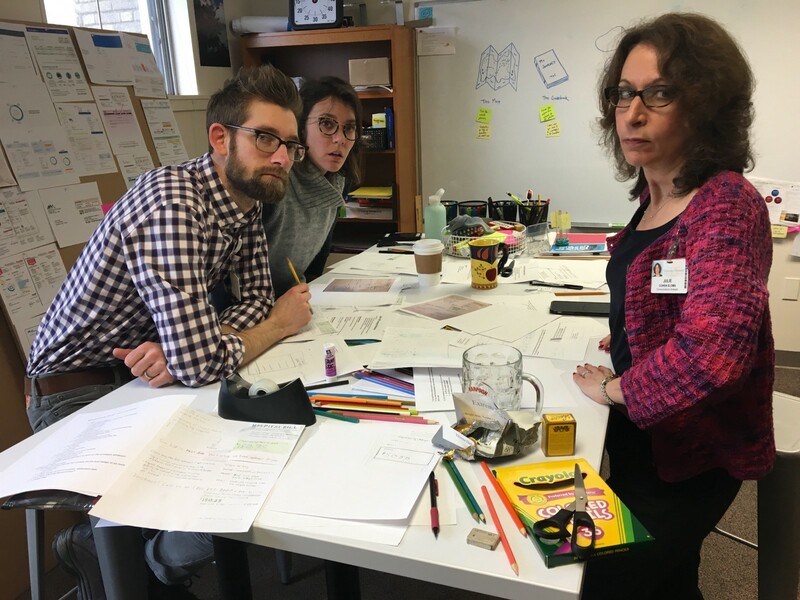 Jeremy, Colleen and Julie mid-sketch and looking a little put off — angry even. Menacing even. A few of the team’s initial sketches. Interestingly, we initially gravitated toward graphical data representations like charts and graphs, but as we worked through the key problems to be solved we realized these were not as important as we’d originally thought. After consolidating our favorite ideas, we created a prototype and tested it in the field, with great initial results. Since that time, we have cycled through many more versions of design and testing. Below shows the current bill on the left, and some sample redesigned front pages on the right. Here is one of our awesome advisors adding his notes about our bill. We captured patient feedback and put it all on the wall so we could address it efficiently. Their comments and questions led us to an innovative new ‘minimum payment’ option that we would not have thought of otherwise. Similar to a credit card bill, for people with higher balances, there is an option to make a reduced ‘minimum’ payment and pay the bill off over a longer amount of time. SO much better! Not as daunting, more friendly. It’s easier to read and understand. I like the summary. It’s easy to see how much is due and when. We’re currently in the process of working with our billing statement vendor to bring this new bill design to life. 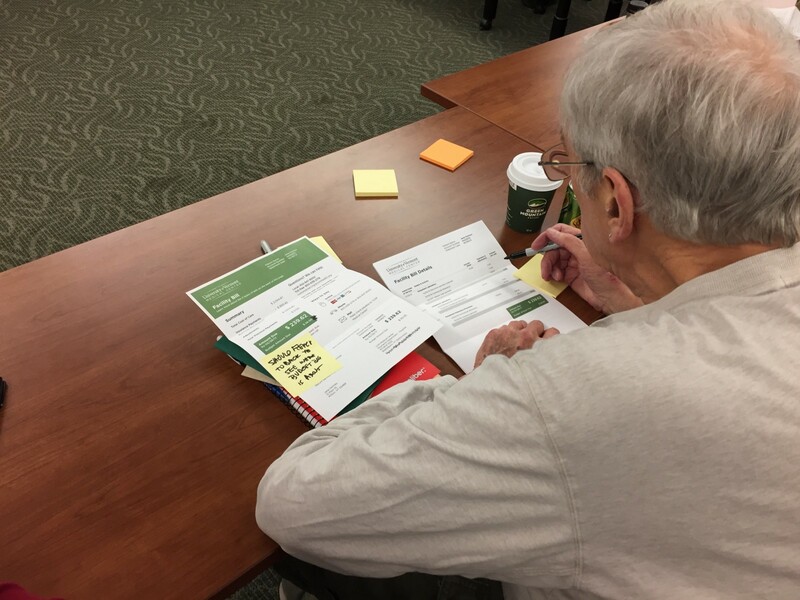 This is one of the most challenging parts of the process, because it depends on coordinating many diverse groups of people — in addition to our bill vendor who creates and mails our bills, we also need to work with the bank that processes the billing slips and our internal folks who work with our billing data systems. Fortunately, we have an excellent, enthusiastic project team that encompasses billing leadership, data science, design and communications. We are keeping our eye on the ultimate goals of reducing confusion, making our bill less terrifying, increasing our rate of payment and reducing the number of folks we send to collections. We can’t wait to share the final design once it’s launched. Discoveries, stories, and case studies at the intersection of design and healthcare from The University of Vermont Medical Center.